I don’t attend many battles. In my lifetime, large-scale military operations have been conducted in other countries, and I’ve never even visited a civil-war reenactment. Honestly, even a scrimmage makes me uneasy. 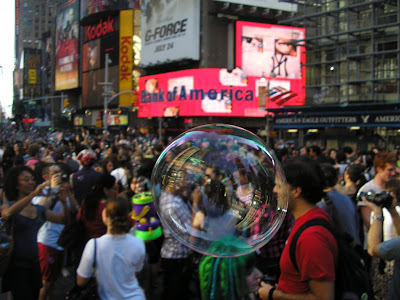 So, my choice to attend the Bubble Battle in Times Square in mid-June took major guts on my part. And I didn’t even come armed. I showed up to the Newmindspace-sponsored event sans any bubble weaponry, and was amazed at how far bubble-technology has progressed since the mid 80s. Bubble wands, bubble guns, even bubble producing hats. And after being a weirdo who shows up to a bubble battle with only a Kodak Sport Single Use Camera (thanks, Kodak! ), I was eventually donated some bubble ammo and a small hoop. But even then I couldn’t really attack anyone. 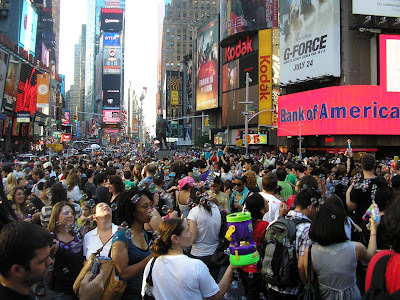 The guy in goggles and pink camouflage was double-packing the bubble machine guns, and I knew I’d just be doused. It was far more fun to sit on a bench and blow bubbles in the general direction of bemused tourists and confused locals. And, with my trusty disposable Kodak waterproof camera, I had no worries about any damaged photos while engaged in battle. After a few hours, the streets were slick with bubble juice and the sun began to set. Bubbles had proven to be uncooperative photo subjects, and lungs began to fatigue from blowing through soap-soaked hoops. 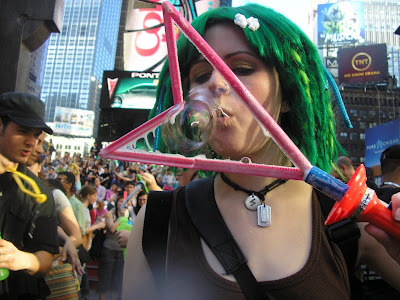 I was proud to donate my bubble paraphernalia on to the newbies who arrived on the scene, eager for the thrill of battle. March on, brave minions. March on.